Welcome to Mountain Tennis and Pickleball! 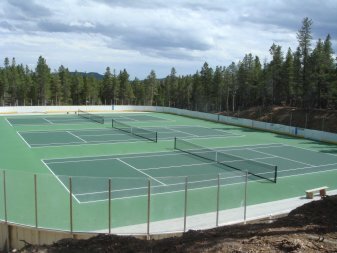 Mountain Tennis and Pickleball (MTPA) is a Nederland-area non-profit managing tennis and pickleball at the Nederland Ice and Tennis Park and at the Nederland Community Center. Cost is the same at either location: $5 daily or monthly (starting at $10) and annual (starting at $100) passes. Fees support leasing the Community Center, equipment maintenance, junior scholarships, and non-profit insurance. Organized pickleball games are held year-round every Mon., Wed., and Sat. mornings from 10am-12pm and also on Wed. night from 6-8pm at the Nederland Community Center. We also organize outdoor pickleball at the Nederland Ice and Tennis Park, on Sat. mornings 10am-12pm from May-Oct. Other classes and clinics are listed on our calendar. Tennis from May-Oct. 31 at the Nederland Ice and Tennis Park is first-come/first-serve. Other classes and clinics are listed on our calendar. Create an account (or purchase a pass) to be placed on our Player List (only shown to other members). Registered users can log in. Read more about Welcome to Mountain Tennis and Pickleball! Guests may play twice for free and after that they need to buy a pass. Please do not have them pay the NCC - MTPA rents the space and so the money needs to go to MPTA not NCC. As members, you do not want to be subsidizing other players to keep your costs the same. There are sheets on the door to the gym and at the entrance of NCC that inform folks on how to pay plus it’s on this website. Come join other women and instructor Krista Crabtree for an intermediate clinic and round-robin play for two sessions. Total Cost: $30. Contact Krista Crabtree, baby@sheskis.net, 303-506-1580. If you pay online, please bring your receipt. Pickup Tennis from 6pm to dusk. Great time to work on your skills. The tennis courts are now open and the weather forecast is awesome so get out and play. Please purchase your pass either at http://nedtennis.org or send a check made out to MTPA and sent to Darren Davenport, P.O. Box 2004, Nederland, CO 80466. Note: The purchasing system is currently not emailing the invoice automatically and PayPal will send an invoice. Invoices will be sent out manually via email. You can also view and print the invoice via your account page. Read more about Tennis Courts Are Open! We've been blessed the last couple months with lots of players so it's time to institute a crowded court player rotation system to keep bench time to a minimum and is consistent among the sessions. This is based on customs observed at other courts or published on the interwebs. When there 10 or fewer players continue current player rotation systems. New (and occasionally old) Pickleball players often wonder why they have to pay MTPA to play at the Nederland Community Center. The literal bottom line is because MTPA negotiates a lower cost to play at the NCC. Since Ken Adler brought the game to Nederland and, with the help of Charles Wood and others, painted the lines on the court and bought the nets and other equipment, a goal has been to keep the game affordable. When Pickleball joined forces with the Nederland Tennis Association a few years ago that goal became formalized when MTPA signed the first rental agreement. Gym is booked for another event. Repeats every week every Thursday until Thu Oct 26 2017. Now's a great time to renew your pass at http://nedtennis.org. There are still some loose ends to finish up so your patience is appreciated. See you at the Season Opening Party on Saturday, June 10 from 11-2pm. See http://nedtennis.org for more info.